Description: If you think Canadians are a logical bunch, think again. We’ve had some wacky laws on the books over the years. Get ready to read some of the strangest laws ever to make the books! # in Winnipeg, you can sit on an alligator and even poke it, but you can’t provoke it into a fight? # an old B.C. law supposedly made it illegal to kill a sasquatch? # an old Toronto bylaw made it illegal to drag a dead horse down Yonge Street on Sunday? # in Fredericton, N.B. it’s against the law to wear a snake? This book features over 200 crazy laws from coast to coast, along with hilarious illustrations! "Ok, Jake, I got the point -- now zip it while I read this kids book on the Titanic"
"OK -- but Dad says you have a unhealthy obsession with the Titanic"
"Yeah -- you go tell Daddy that mom says -- hmm obsession -- can we talk about Scarlett Johanson or his shoes now"
"Mom, how about I just shut up and get back to reading"
Before I write out Jake's review, just reminding you that Jake doesn't like things that are too sad or scary and it usually effects his enjoyment and ratings of the book. 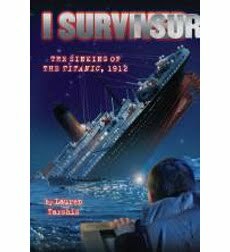 Jake's Review: Jake: Mom, why are you so fascinated with the Titanic, it is just horrible, scary and sad part of history. Why would you want to read over and over about it? (Mom: Good question Jake, I will talk a little about that in my review.) This book made me very sad about what happened to all those people who died on the Titanic and I am really scared about going on a boat now (Mom's note, I should have listened to Jeff when he said it was probably not a good idea for Jake to read it) It makes me sad that people died because the idiot's in charge of making the boat screwed up. (Mom's note: sweetie, you sure nailed that one right on the head). I did like all of the different people in the story and I liked how short and exciting the book was. I don't like the picture on the back for the author's next book -- it's a really scary looking shark. I like the way the author tells a story but I don't think I want to read anymore of her scary, sad stories right now. These books were given to me by Scholastic in exchange for an HONEST review. You Can't Do That In Canada sounds great!